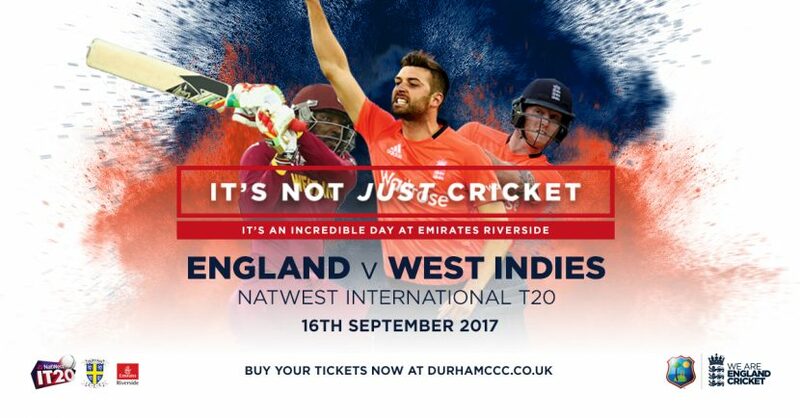 Tickets are on general sale NOW for next year’s NatWest International T20 between England and the West Indies at Emirates Riverside – the most hotly anticipated rematch in world cricket! On Saturday, 16 September 2017, the two sides meet for the first time since April’s last-over thriller in the ICC World T20 final. Carlos Brathwaite hit four consecutive sixes to overcome England on that occasion – but will it be repeat or revenge at Emirates Riverside? Catch a glimpse of international superstars such as Chris Gayle, Ben Stokes & Joe Root and secure your seat for what is expected to be a sell-out fixture under the lights at Durham! Tickets start at £35 for selected stands, with premium seating just £40 & juniors admitted for £10. Members can still access premium seating for £35, with exclusive balcony seating priced at £60. To buy, click here or call the Box Office on 0844 499 4466.